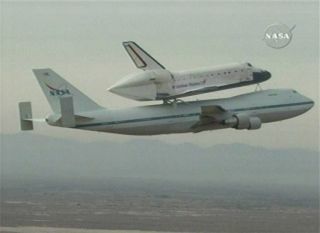 The space shuttle Atlantis is halfway through across-country trip atop a modified 747 jet toward its home at NASA's KennedySpace Center in Florida. The shuttle will spend the night at Biggs Army Airfield inEl Paso, Texas after flyingthere today from California. If weather permits, Atlantis will complete itstrip east tomorrow. Atlantis landed May 24 at Edwards Air Force Base in SouthernCalifornia, instead of its usual landing strip on the east coast, because ofstormy weather in Florida. The cross-country trip, capping off a successfulmission to repair and upgrade the Hubble Space Telescope, costs NASA $1.8million. Thunderstorms and high winds prevented plans to begin flyingAtlantis back home early Sunday from the backup landing site. The shuttle isnow riding atop one of NASA's two modified Boeing 747 jumbo jets, which havebeen converted to allow a 100-ton shuttle to ride piggyback for the trip home. Atlantis is returning to Florida after a 13-day flight thatmarked the fifth and final service call on the 19-year-old Hubble SpaceTelescope. While shuttle technicians prepared the spacecraft for its trip home,Atlantis' sister ship movedinto position for its planned June launch toward the InternationalSpace Station on Sunday. Endeavour is slated to launch a crew of seven astronauts tothe station on June 13 to deliver the last piece of outpost's massive JapaneseKibo lab. Five spacewalks are planned during the 16-day mission.